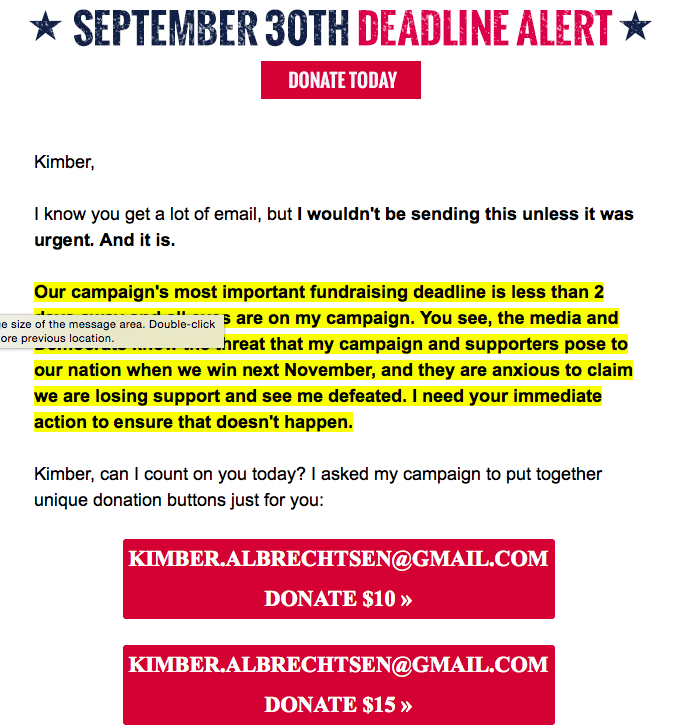 If you've ever been dumb enough to give your email to a political organization, I imagine you've been getting a lot of super annoying emails lately begging for money. I certainly have been. "Kimber, can I count on you today?" No, Marco! Stop using my Christian name like you're some used car salesman. It's Mrs. Nathan Albrechtsen to you. Or this gem from Ted Cruz, "We're building real momentum in key states, but we must keep the campaign doors open if we want to fight off the Washington Cartel and be the ones to reignite liberty." Reignite liberty? I'm sorry, but I don't want to set anything on fire, let alone my liberty. Who is writing your dumb emails? Why is "Cartel" capitalized? Are you talking about the Senate t-ball team by the same name? Or have your shadowy political enemies decided to make their league of villainy official by filing an LLC? Another from Marco: "Kimber, I know you get a lot of email, but I wouldn't be sending this unless it was urgent. And it is." You know what's urgent? A top secret mission in Miami that requires a stay-at-home-mom to infiltrate a Cuban spy ring. Email me then, Marco. I bet my "unique donation buttons" look totally different from everyone else's unique donation buttons. The spastic formatting is killing me. Bold. Highlighted bold. ALL CAPS RED HIGHLIGHTED BOLD. I need your hard-earned money to pay for yard signs and slick suits to wear to debates so I can look good while I make stuff up. I also need money to pay Hulu for commercials that will annoy you while you wait for Brooklyn Nine-Nine to come back on. Send me money. You will feel smug and hopeful, like you are investing in America's future, but know that you're really just bankrolling my small-town-diner crawl across America. Without your donation I could not afford the extra side of bacon I love so dearly. Bacon=relatable, accessible, AMERICA. If anyone's looking for a campaign manager, I'm happy to talk about my credentials over something pumpkin spice-flavored, your treat. HAHAHAHAHAHA! I just. Can't stop laughing.